Hi, My name is Smalls! I am a fawn Male French Mastiff/Dogue de Bordeaux Dog. I am 5 and weigh 100 lb. I live in Fort Worth, TX. 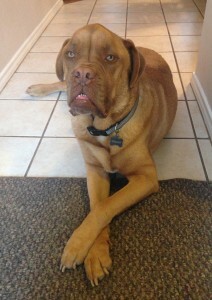 This beautiful purebred Dogue de Bordeaux is looking for a loving family to offer him a forever home where he will be cherished for the rest of his days. Smalls is just 5 years old, healthy, neutered and up to date on his shots. He is an incredibly loving dog; faithful, protective and very affectionate. Smalls is being rehomed by his family. They are broken hearted to have to make this difficult decision, but with 2 full time jobs and a baby, they just do not have the time or ability to provide Smalls with the attention, exercise and care that he needs and deserves. They feel that it would be best for Smalls to be placed with a family in which he can be the center of attention! Smalls perfect home will have a large, securely fenced yard, some great kids aged 5 and up, and people with lots of time to spend with him.? He would prefer to be an “only pet”, but if there is another female dog in the home, it should be OK. Smalls has never met a cat before, so how he would do with them is an unknown. Smalls will bring all of his supplies along with him, and will provide your family with unlimited unconditional love, lots of licks, plenty of laughs, and a die hard protector of home and hearth. Please offer Smalls a home today. He will leave VERY BIG paw prints on your heart! To offer him a home, please visit: https://petprosservices.com/adopt/. There is a $75 rehoming/adoption fee. All supplies included. Accessories Included: We will provide his crate with his bed, his leash, a toy that he has had since he was a puppy, and a bag of dog food. We can also email photos of him as a puppy. We can also provide vet records. Smalls is a big sweetheart. He loves to be loved on and cuddle. He can sense if you are sad or sick and he wants to comfort you. Smalls has many traits typical for his breed. He is calm and loves to lay around. He is a great guard dog. He can also be stubborn at times. He does know basic commands: Sit, down, leave it, stay, go to bed (to go in his crate), go outside. Less is more with Smalls. He responds best to positive reinforcement. At the vet, he does best if they don’t try to restrain him, but instead give him treats as they do what they need to do. If he has something in his mouth that you don’t want him to have, offer a treat so he will drop it. He is not aggressive about his food bowl, and takes treats very gently. Smalls gets along well with kids 5 and up. He is kind of anxious around babies, and has not been around toddlers. He has not been around cats or small dogs. We live in a house and have a big backyard. Smalls has lived here since he was a puppy, so he has always had a lot of room. Smalls is also crate-trained, so when we leave the house, he either goes into the backyard, or into his crate. We do not let him roam freely around the house if we are not here. We have another dog, a female lab, and he gets along with her. If it is a very hot or very cold day, we do not leave him outside for more than an hour at a time. It’s a good idea to have tissues or small cloths handy to wipe his drooly mouth occasionally. We are a new family of 3. My husband works a lot, I am a full-time student, and we just had a baby. Smalls’s Favorite Toys, Foods, Activities? Smalls loves soccer balls, tennis balls, deer antlers, and stuffed animals, especially ones that squeak. We feed him Nutro Natural for Large Breeds Chicken flavor. For treats, he pretty much likes them all. He also loves peanut butter. We do NOT give him rawhide, because he has choked on it several times. He chews on it and gets it soft, then tries to swallow the whole thing and my husband has had to give him the heimlich more than once. Smalls loves to go on walks. He likes to run, but he is not a long distance runner. He is large and powerful, and requires a strong hand to walk him. He likes to lay in a kiddie pool to cool off in the summer. He is not a fan of hot weather. Once when I was sick, Smalls was trying to comfort me, so he climbed up on the couch and laid on top of me. He’s so sweet, but doesn’t realize how big he is. Why is Smalls Being Rehomed? With our schedules and a new baby, we are too busy to give Smalls the attention he needs and deserves. Also with him being so anxious around babies, we are not comfortable having him around our baby. We understand that is something that training can help with, but we just don’t have the time to devote to that right now. We are looking for a new forever home for Smalls. His new family should live in a house with a fenced backyard, and be willing to let him be an inside and outside dog who sleeps inside. They should have time to give him plenty of attention and take him on walks. Ideally they would not have other dogs or cats, but if they did have other dogs, then a female would be better.